In Part 1 you learned about the overview of my whole n=1 experiment. 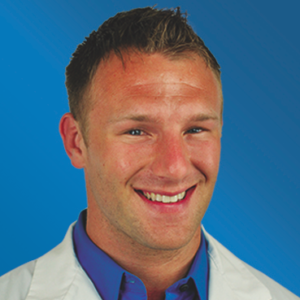 In this post I want to go over my baseline labs while I was on a low carb high fat diet. Last week I also wrote about advanced lipid testing and why cholesterol per se is not the enemy. If you haven’t done so go read that before reading this post so this stuff makes more sense. Now these labs were done in the spring of this year and my weight was about 219-220. So as you can see, I was in the 30th percentile for my LDL cholesterol but 60th percentile for my LDL particle number. I would consider this DISCORDANT. LDL-Cholesterol describes the amount of cholesterol contained in the LDL-Particle and as described in my last article, LDL-C correlates decently to the LDL-Particle number. However the cholesterol content of the LDL-Particle can vary and when they don’t match up (see the above table), this is called discordance. Now when these two values don’t match up, it is the LDL-Particle number that is more predictive of heart disease. See this study. So while I don’t fit the criteria for the highest risk or CVD according to this graph above, my numbers are still discordant which means my LDL-Particles at the time were carrying less cholesterol than what would be considered concordant. 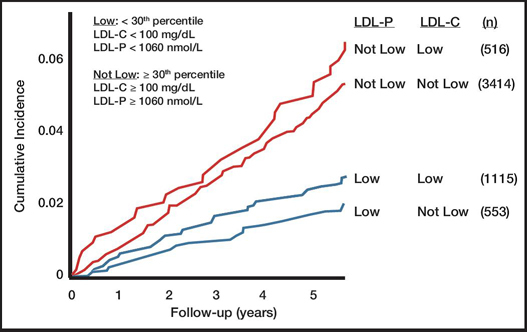 While neither number (LDL-C or LDL-P) is in the range of treating with a drug for primary prevention, it was mildly concerning to me as a lean and low risk guy (no smoking, normal blood pressure, no family history of heart disease, etc). 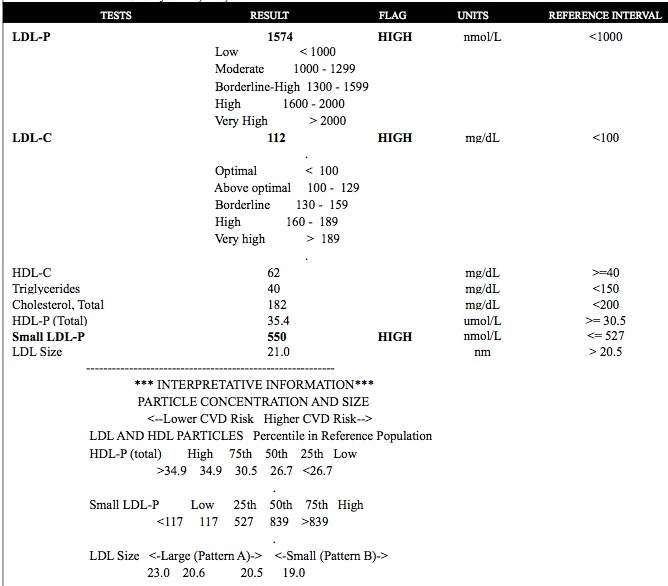 You will notice also that my triglycerides were low and HDL-C high. This is what happens on a lower carb higher fat diet. 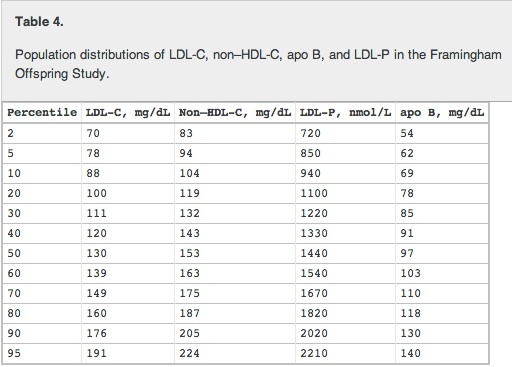 As you will learn throughout this series, these numbers are trumped by LDL-P. In my next post I will go over a few other of my baseline labs that might have had an influence on the above number.